What does a large International company do after completing 40 acquisitions across 30 countries? They remove duplicity and optimize their costs wherever possible. The method for core business operations is a common process to experienced staff who manage core cost areas. Gunnebo is an international company specialised in security systems. With 6,000 employees in 30 countries they offer the best solutions to protect individuals, buildings and properties. Following the acquisition of over 40 other companies, Gunnebo started a process of restructurations and transformations, including the reduction of expenses. However, this project remained inactive as noone knew how to tackle it and with what structure. This was the reason Expense Reduction Analysts were called to help. 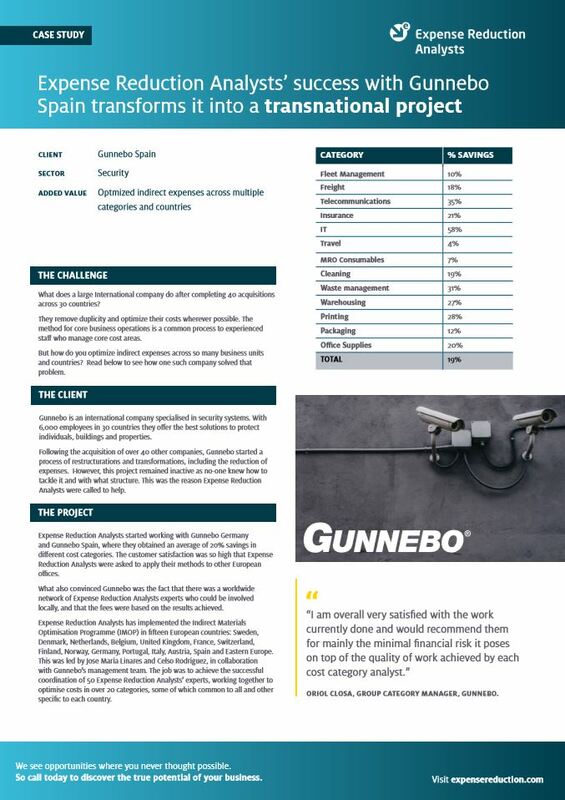 To find out exactly how ERA helped Gunnebo, including specific examples and savings, download the full case study today. If you would like to learn more about how ERA can help your organisation, contact us today to discover exactly how we can help you gain a competitive advantage.